These cotton ties fasten the natural cotton liner into place. They can either show or be concealed. The Somerset Willow company does not make any of our coffins on a Saturday or a Sunday, in honor of the religious traditions of many of our clients. In accordance with Jewish Law, the glues in the Somerset coffins do not contain animal products, and there is no metal used in their construction. There are screws that affix the lids to the coffins for transport but they can be removed after arrival if desired. Somerset will make oversize coffins upon request. 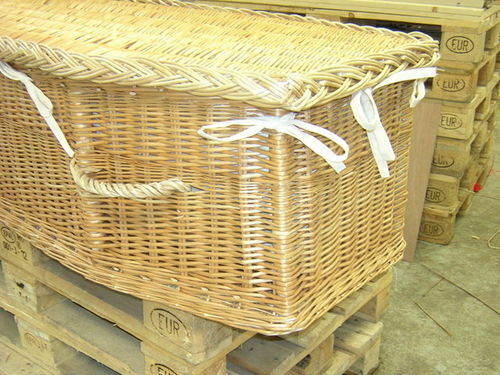 For many years they have specialized in fine furniture construction, and have made balloon baskets for hot-air balloons that can carry 50 people. Custom manufacture is their specialty. Please allow 8-12 weeks for delivery; more if normal container transport is desired.